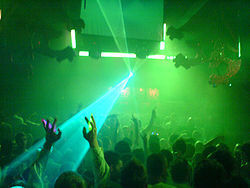 When you were younger, you appreciated the fact that New York City offered dance clubs for people under the age of 18. Now that you've turned 18, though, you want to move up to the more adult dance clubs, but you're not sure which ones are the best. We've listed five of the numerous dance clubs that cater to patrons 18 and over. They're located in different areas, so you should have no problem finding one close to where you live or work. Be aware, though, that some of them only allow 18 to 21-year-olds at certain times, and then the club becomes 21 . This club is very popular with twenty-year-olds, so if you're in this age group, you might really enjoy this venue. The music ranges from hip-hop to "house selections" (the DJ picks them) but you're bound to enjoy every selection. It's a place that invites you to have fun, from the moment you walk in the door and see the unusual décor until you leave. It's also in Manhattan, so it's a good place to drop in after work. This is one of those clubs that only admits 18 and over at certain times. During those times, however, you can enjoy hip-hop, reggae, and the most current songs on either of the two levels. The location of Santos is right on the Chinatown-Tribeca border, so you are bound to be close to it if you live or work in either of these neighborhoods. With little, if any, cover charge, this makes for a fun but inexpensive evening. This nightclub gives you three levels of enjoyment. Listen to live music on the main floor, enjoy the DJ on another floor, and visit the game room on the other floor. 18 and over patrons can get in, but you must have two forms of identification. The cover charge changes depending on the day of the week, but it's still very reasonable. You won't spend a lot to have a good time at Downtime. Ladies, come be the "Queen of Delancey Street" again at this reconverted shoe store. Gentlemen, bring your date to a live show in the upstairs concert hall, and then take her to the lounge downstairs afterward. Depending on who is performing live at the Bowery Ballroom, it may be possible for 16-year-olds to be admitted, although-of course-they will not be served alcohol. However, this means that you might have a very classy place to go to after a prom or other school functions. You can find out before you go.